The reform institute's 13 partners present the fruits of their efforts toward sound public governance in a forum. With its belief in sound public governance as the foundation of a strong, competitive nation, the Institute for Solidarity in Asia (ISA) has collaborated with public institutions to instigate change through creating, executing, and sustaining effective development plans. 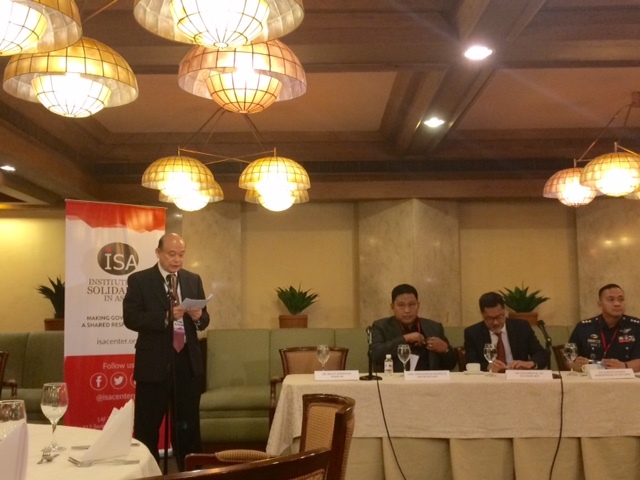 Now, with the Public Governance Forum (PGF), ISA aims to showcase the results of its partner organizations' efforts to prove that transformation is possible. This year's PGF at the Philippine International Convention Center brings together 13 national agencies and local government units (LGUs) each bearing the fruits of the development and implementation of their respective good governance initiatives all guided by the Performance Government System (PGS). PGS, which serves as ISA's core approach for its partner organizations, is a system patterned after the Balanced Scorecard model from the Harvard Business School. It enables ISA's partners to articulate long-term development goals, assign organization-wide and community-wide accountabilities, and improve transparency by creating sustainable governance mechanisms. Each organization in this year's forum is evaluated based on PGS and depending on the results, will be rated according to the four Governance Pathway Stages: Initiation, Compliance, Proficiency, and Institutionalization. Gunning for Institutionalization this year is the City of San Fernando, La Union which envisions becoming Northern Luzon's Center for Health and Wellness by 2020 through increasing the number of model barangays and setting itself as an ideal business location for health and wellness enterprises. Two local governments are also starting on the path towards good governance via Initiation this year, with the City of Bislig, Surigaodel Sur setting its sights on becoming a model city for organic agriculture and the Municipality of Dinalupihan, Bataan aiming to become the primary wholesale trading center for agro-based and manufactured goods. The Philippine Air Force is also up for Compliance this year with its modernization efforts, as well as the Governance Commission for GOCCs which has taken steps to ensure that government-owned and controlled corporations adhere to the highest standards of corporate governance to become significant tools of the State in attaining inclusive and sustainable economic growth. The rest of the forum's participants are set for Proficiency status starting with national agencies like the Armed Forces of the Philippines which has worked on improving its humanitarian assistance and disaster response, internal security operations, and territorial defense programs, and the Development Bank of the Philippines which has focused on supporting critical industries in urban and rural areas to become a catalyst for a progressive, poverty-free Philippines. Philippine Heart Center, meanwhile, continues to uphold the highest standards of cardiovascular care in the country through comprehensive care, education, and research. be the sports event center of the South; and the city government of Butuan in the CARAGA region, which intends to be a model for sustainable forest-based economy in the country. According to ISA Chairman Dr. Jesus Estanislao, the PGF co-presented by the Center for International Private Enterprise and National Competitive Council Philippines also goes beyond being a showcase of each organization's successes. "Ultimately, this forum wants to inspire other institutions to take that crucial first step towards good governance. We are glad that we have partners who have begun change within their organizations but now is the time to spark bigger changes among more groups and we hope that the PGF serves that purpose," Estanislao concludes. For more information and updates on the Institute for Solidarity in Asia, log on to www.isacenter.org or follow them @isacenterph on Facebook, Twitter, and Instagram.